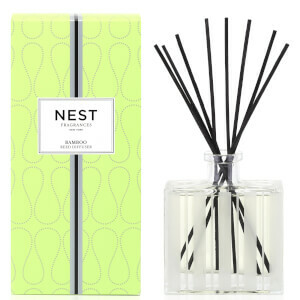 NEST Fragrances present the Bamboo Votive Candle. Poured into a luxurious frosted glass votive, the scented candle is made from premium cosmetic grade wax with a blend of exquisite essential oils to fill your home with an intense, long-lasting aroma. Notes of flowering Bamboo essence create a clean, effervescent scent while a bouquet of white florals adds a delicately feminine touch. Sparkling citrus oils and green accords leave your abode smelling zesty and fresh to uplift and invigorate. Presented in opulent branded packaging, the candle makes an ideal gift.